Download the PDF version of District Dispatch here. 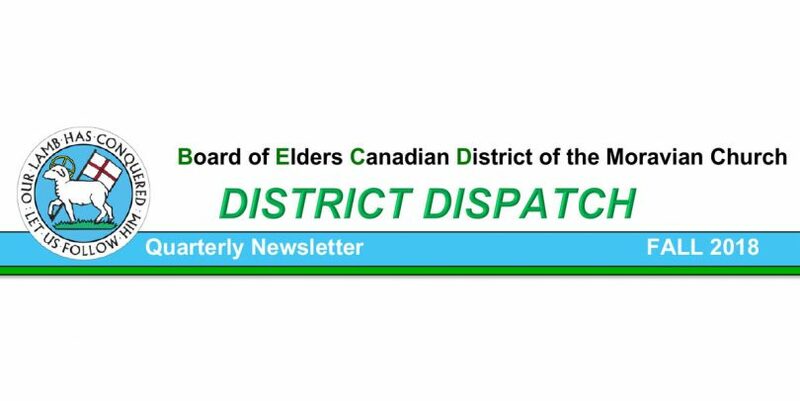 The District Dispatch intends to provide information and updates about the work of the Canadian District of the Moravian Church. While we have not formally communicated with congregations in the recent past using this type of format, the District Dispatch is part of our effort to be more attentive to our local congregations. In this way we hope to better serve your needs so that we may draw together and connect with one another as part of the Moravian Church – something greater than ourselves. Bringing to your attention certain topics is important as we refine practices that will support the work of the Moravian Church in Canada. We welcome Holly Heffernan back to the Board of Elders Canadian District (BECD) – a case of Holly replacing herself. Holly was elected to the Provincial Elders Conference (PEC) at the 2018 Synod, creating a vacancy on the BECD. Regretfully, she needed to resign from the PEC due to family circumstances. Holly agreed to let her name stand for the vacant BECD position and was subsequently reelected following a District election where each Pastor and Joint Board received one vote. In early spring, each congregation can expect a visit from BECD members to speak with them and listen to how we can help equip congregations to be agents of God’s transforming love in our world. These visits will start a multiyear effort to address a resolution from the 2018 Provincial Synod that directed the PEC and Districts to listen to congregations about their needs and how these needs might be reflected in the longstanding inquiry around Identity, Purpose, and Organization of the Moravian Church Northern Province. In response to a resolution adopted by the Canadian District Synod in 2016, the BECD has recently established a Governance Task Force to review the relationships between Moravian entities in the Canadian District. The mandate of this task force is to examine current standards for charities as set out by Canadian legislation and by the policies of relevant authorities such as the Canada Revenue Agency. It will also consider the accounting, auditing and reporting requirements for the BECD and its Canadian Moravian related entities. The work of the Task Force has commenced with the hiring of an external consultant. A final report is expected January 2019, with recommendations and resulting actions taken by the BECD provided to the next Canadian District Synod in 2020. Moravian congregations and entities are governed not only by Canadian law, but also by the Book of Order of the Northern Province. As members of the Worldwide Unity, Canadian Moravians draw strength and purpose from the legacy and obligations shared with other Moravians. These foundational factors will be guiding principles throughout the review and the resulting recommendations should better position the BECD to fulfill its obligations to the PEC as well as Canadian legal requirements. Indeed, the Book of Order may eventually be amended if changes are deemed necessary to comply with legal, fiduciary and trust responsibilities under Canadian law. The Task Force is chaired by BECD President, Greg Weir, and includes former BECD President, Graham Kerslake; BECD member, Bob Hawkesworth; and the Chairs of the various Canadian entities: Historical Society, Camp VanEs, Moravian Foundation, Mission Society and Common Ground. Following the decision in February by Justice Henderson that confirmed BECD ownership of property in Bruderheim, an attempt by BECD was made in early spring to gain access to the property which was rebuffed. Subsequently, the Bruderheim Community Church applied to the Court of Appeal of Alberta to review Justice Henderson’s ruling. In June, Justice Henderson invited both parties into a Judicial Disputes Resolution (JDR) process, part of the Court of Queen’s Bench of Alberta hearing trials in civil and criminal matters. This process encourages parties to formally explore possible avenues to resolve outstanding matters related to the closure of the church. In September, both parties to the dispute entered into a Consent Order staying the appeal proceedings until December 1, 2018. At this time, we have hired a professional firm to provide expert appraisal of the property in Bruderheim. This will assist to resolve outstanding matters and perhaps form the basis for a future agreement. Pastor Aaron Linville was installed as the Pastor at Millwoods on Sunday, November 4 with much excitement and thankfulness. We are grateful to the Joint Board at Millwoods as well as Pastors Milton Liska and Joshua Pantoja who provided welcome spiritual and temporal leadership to their community. Pastor Aaron with wife Amy left the warmth of Northern Carolina and their Rural Hall Moravian Church where Aaron provided Pastoral leadership for the past number of years. They are eager to embrace the change in all types of climates – and we anticipate they have a good head start having a dog named Goose. Perhaps soon, Canada Goose! Pastor Rebecca Craver has applied for Maternity Leave at the beginning of December as she and husband Bobbie O’Connor anticipate the birth of their second child. During the leave, Pastor Trina Holmberg will provide part time clergy leadership to Edmonton Church. Trina, a former member of the Bruderheim congregation, and her husband Ken returned to Alberta this fall having completed a call to Redeemer Moravian Church in Dublin, Ohio. Good News and Common Ground Café in Sherwood Park have combined halftime calls to both Ian and Eileen Edwards. These calls are coming to an end and one clergy position will be eliminated as the Board of Directors at Common Ground adjust their staffing to better meet their not-for-profit corporation goals. Pastor Ian will be called to full time service at Good News and Pastor Eileen will be called to District service for up to six months commencing January 2019. The District Board would like to express its gratitude to Eileen and Ian for the dedication they have shown to their calls at Good News and Common Ground Café. Our Moravian Pastors Eileen and Ian Edwards began this unique ministry in Sherwood Park using the resources of the Province’s Emerging Ministry Task Force to ‘do church differently’. The focus at Common Ground has been, and continues to be, community building. Although there will no longer be Moravian clergy called to Common Ground, the District and Moravian congregations in the Edmonton area are committed to continue this good work with clergy from each of the congregations providing a half day of service at the café. Common Ground Café is Moving! The Common Ground Board is in the process of finalizing an agreement with Christenson Communities Ltd. to provide a custom designed café space in Central Sherwood Park. The new space is scheduled to be available for occupancy in early 2019. The café will continue to operate as usual through December 2018 in its current location. The new location will provide a more central, higher traffic setting in Sherwood Park, close to education, arts, sports, medical and seniors facilities. They will continue with their traditional menu and with the same community outreach and fabulous volunteer staff. The staff and volunteers at Common Ground Café would like to express their heartfelt thanks to the Edwards for the amazing coffee ministry they created in Sherwood Park. They have touched thousands of lives and we pray their new ministries will bring them much joy and satisfaction. Our youth activities value diversity and affirm each person’s unique spiritual journey to follow the way of Jesus in community and love for neighbour. February 15 – Feb 18: “Winter Retreat in Banff” for Junior and Senior High Students. Led by Rev. James Lavoy, Pastor at Rio Terrace Church. Details to follow. Join with other Moravian Youth and their friends for additional activities in your region. In Calgary, contact Pastor Steve Gohdes at Christ Church, (403) 271-2700. In the Edmonton area, contact Pastor James Lavoy at Rio Terrace, (780) 487-0211. The CMMS recently received notice of a $25,000 International Development Grant from the Government of Alberta for our work to reduce the impact of global poverty by helping to provide education for children attending the Moravian Institute in Rajpur, India. Thank you to Steven Brese for his work in submitting this grant proposal. Volunteers are needed to help with hurricane response efforts in North Carolina and the US Virgin Islands. If you are interested in participating in either of these missions, please register at www.moravianmission.org/mdr/ You can receive up to date Board of World Mission newsletters and other communications by registering your interests at www.moravianmission.org/serve. Congregations and/or regional groups will be invited to participate in an annual Mission Day of Service beginning in spring 2019. The PEC will work with the BWM to provide resources. A date has not yet been announced. Congregations are strongly encouraged to designate a Sunday to focus on opportunities to be involved in global mission endeavors. The PEC will work with the BWM to provide resources. The community of Nain, Labrador was founded in 1771 as a Moravian Mission Station. This was the first Christian mission to Inuit in what is now Canada. The Moravian Church has continued to have a strong presence throughout Labrador ever since. Today, Nain is the northern most community in Labrador and is accessible only by sea and air. Its population of approximately 1125 is subject to many of the social conditions that plague other remote northern communities. Poverty is widespread, declining animal populations make hunting more difficult, housing, food and other goods are expensive, alcohol and domestic abuse is common, and the suicide rate, especially among young people, is high. Offering a sense of hope through God’s eternal love to the young people of Nain is critical in helping them to rise above these conditions. With the backing of the Canadian Moravian Mission Society (CMMS), the Board of World Mission (BWM), Christ Church in Calgary and the Moravian Church in Newfoundland, a project was developed to bring youth leaders from Nain to VanEs and send a team from Alberta to offer a Vacation Bible School in Nain with the hope that it would inspire youth leaders from Nain to emerge. 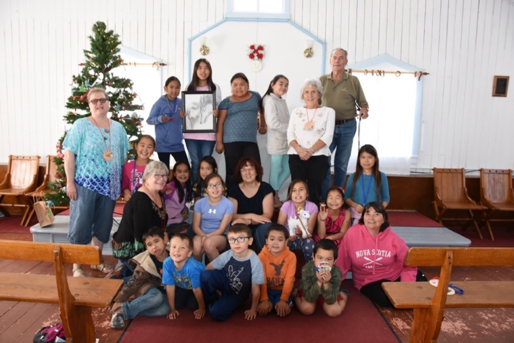 In August 2018 a five-member team led by Marilyn Gurnsey, a longtime director of camp programming at VanEs, headed off to Nain to offer a weeklong Bible School. The team was provided with a house and vehicle thanks to a generous host, and were given access to the Jans Haven Memorial School to operate the program. Activities included bible readings, stories, and videos, large group discussions, small group work, and craft time. Crafts included the making of ornaments which were used to decorate a Christmas tree in the church for the candlelight service on the last night of programming. As food insecurity is an issue, the children were also provided with a breakfast snack and a lunch. A Wednesday evening Women’s Fellowship was also offered which included the Alberta team leading a devotion topic based on women spreading the gospel by teaching their children as well as a lesson on making Moravian Stars from ribbon. The culmination of this program was a cold plate pot luck supper at the school and a candlelight service at the Moravian church that was open to the community. The service included the singing of “Jesus Loves Me” and “Away in the Manger” in Inuktitut and English. For many of the children, this was the first time they had stepped foot inside the Nain Moravian Church. The relationship between the CMMS and the Mission Province of Labrador began in 2016 when three young people and two chaperones from Labrador participated in church camp at VanEs. Two young adults from Alberta also travelled to Labrador to help at a camp program in Hopedale. We plan to continue this type of camp exchange in the future. The CMMS will continue to look for other ways in which to support and show love for our Canadian Moravian brothers and sisters in Labrador. With only one ordained minister in Labrador, a need has been expressed for leadership development as well as opportunities for spiritual renewal and refreshment of this pastor and the chapel servants who complete all of the ministry functions of the Moravian churches in Nain, Hopedale, Makkovik and Happy Valley-Goose Bay. The CMMS is hoping to work with the BWM to help meet this need.